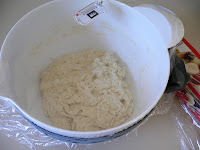 3 cups white bread flour, a scant 2 teaspoons salt, a heaping 1/4 teaspoon yeast Mix the dry ingredients together. 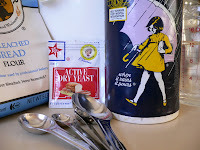 Mix the yeast in first, then the salt, to avoid accidentally killing the yeast. 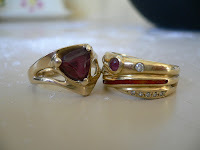 Remember to take your rings off, if you haven't done so already. Add 1 1/2 cups water. Mix again. This is why you want to take your rings off. 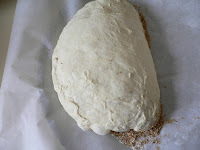 The dough will be shaggy-looking and fairly sticky but cohesive. Cover the bowl with cling wrap. Go ahead and buy the good kind. This generic stuff ain't worth spit. I ended up having to find something elastic to go round it. The little thermometer from REI is handy for gauging oven temp. When the oven's off, that is. 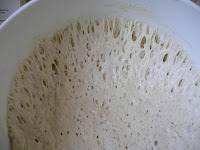 The dough rises for 15 to 20 hours, or more. The recipe says 70 degrees, so I stick the bowl in my gas oven with the door cracked. My house is usually cold. I think it would probably work OK at 60 for the rise, too. 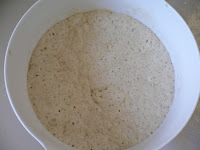 After about 20 hours, the dough will have risen significantly in the bowl and have small bubbles in it. If you tip the bowl, the glutinous nature of the dough becomes more apparent. Long strands of gluten with lots of air in between. 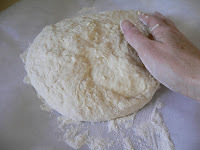 Pull the dough onto a lightly floured surface – I use parchment paper – and with a dusting of flour on your hands just pat it into a round. In the past I've done the second rise on the parchment paper, flat, with a bowl over it, but this time I'm going to proof it in the bowl again, to see how that affects the height of the loaf. Back into the oven it goes, at a slightly warmer temp, around 80, achieved by not cracking the door. It stays there for an hour and a half, until it's time to heat the oven and pot to 450 degrees F.
I like to top my basic loaf with wheat bran (bought in bulk from Wild Oats Market), a generous sprinkle of spicy sesame topping, and just a little coarse sea salt. Don't use too much salt; it's fairly potent. 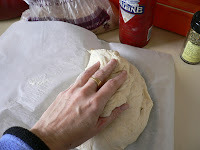 Fold the dough in thirds, like a letter, first vertically, then horizontally. 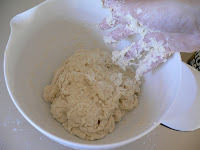 The dough is sticky but a very light dusting of flour makes it workable. next to the loaf, then roll it over onto them and shift it around a little so much of it sticks. Like this. Meanwhile that pot has been preheating in the oven, along with the lid, which I wrapped in tin foil to ensure a tight seal. I pick up the dough and quickly flip it into the pot so the toppings are where they should be – on top. 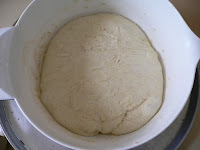 You can give the pot a good shake to settle the dough into shape if it's lopsided. The bread cooks in the pot with the lid on for half an hour. Then with the lid off another 15 minutes or so, or until the crust is a lovely golden color. If bottom-burning is a problem for you, you can put a cookie sheet underneath for the last 10 minutes of cooking. This loaf turned out not quite as golden as I wanted ... I pushed the cooking time because I had to head to work. It could have used another 5-10 minutes to get a little deeper color and crustier crust. But it's still lovely! 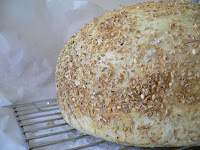 Thanks for hints gleaned from Apartment Therapy: The Kitchen and the posts and comments on Holy Bread and No-Knead Loaf No. 10 at Rose Levy Beranbaum's site. I guess I've missed the hubbub about the no-knead bread. Is it the ease of making it? Is it that it tastes really great? Is kneading really such a chore? I think it's a combination of those things, especially if you're scared of screwing up the rising and kneading and punching down parts of regular bread-making. I've never been attracted by bread-making because it seemed too exacting for my rather improvisational cooking nature, but this is not exacting at all. I don't have to weigh the flour or sift it, for example. Just scoop and level. But the result is a fabulous loaf with crusty crust. I wouldn't say it's better than all other breads (others are better for sweet flavors, for example, or will keep better), but it's so easy to make that I'm more likely to do so regularly. Also, it makes fabulous toast. 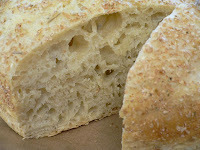 I have been baking bread the "old" way for 20 years, and about 15 loaves of the "no-knead" stuff. Your photos are the best I have ever seen in any bread book to encourage anyone to give it a try. You write simply and to the point, and the photos make it all "real". 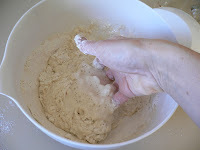 I came to your page because I have a problem with baking the no-knead recipe. In the 15 or so loaves, every single one comes out with a gummy center. It makes great toast, but I want bread I can eat without toasting it. I love the crust and the crumb, but I can't get rid of the gummy center. All my experience tells me it's simply not done...hence to leave it in the oven longer. I have left it in until the top crust is nearly black and it's the same. I have reduced the "lid-on" time to 15 minutes, reduced the "lid-off temp" by 25 degrees so I can leave it in the oven longer without burning the top crust, and I still have a gummy center. 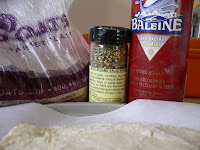 I have tried various flour combinations - from 100% all-purpose, to 100% bread flour, to 1/3 whole wheat and 2/3 bread flour; 1/3 whole wheat and 2/3 bread flour. I'm convinced it's not the choice of flour. Has anyone else had this problem? Does anyone have a solution? I noticed the gummy center the first time I made this loaf, but less so on later ones. Part of the solution is in letting the bread rest sufficiently, I think, after removing it from the oven. It's so tempting to cut into it right away! But ideally it should cool for an hour first. But I'm just guessing here. I'll start another loaf tomorrow and pay more attention to that. It could be I've just gotten used to a cerain amount of gumminess and stopped noticing it. I'm a newcomer to this blog; but not to this bread. I started experimenting with it last fall - after Diane Carmen wrote about it in her Denver Post column. It's easy and tastes great. I've used various combinations of flours and the one I like best is half King Arthur's bread flour and half King Arthur's white whole wheat flour. This is a bread that will bolster your confidence in breadmaking. Hi eljay, thanks for stopping by! I have tried the bread with a little bit of whole wheat. It tends to reduce the size of the holes in the crumb, but is tasty, too. But I admit, I'm a fan of plain ol' white bread, so I stick with that most of the time. Note to all visitors: If you have the patience to read through all the comments on the two Rose Levy Beranbaum links at the end of my post, there's a lot of discussion of variations and variables that I found quite useful. RLB is the author of "The Bread Bible." Hi..lovely pictures! I've been experimenting with the recipe and am onto my fourth loaf. A question..in your picture, you seem to be using a dutch oven with the lid wrapped in foil. 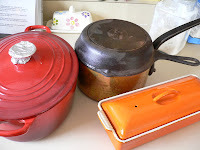 Can I do that with the bakelite lid on my Lodge dutch oven? 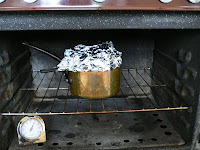 Its supposed to be oven safe until 400 degrees, does the foil help protect it at 450? Thanks..your experiments make me more confident of my own! Hi Neha, thanks for stopping by! That "lid" is really a frying pan. I wrapped it in foil to create a tighter seal between it and the pot. You might also email the folks at Lodge and ask them. 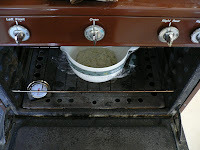 I emailed the French manufacturers of that copper pot to ask about using it at high temps and was told "Absolument non!" So I don't do that anymore. Do you have an iron skillet that would work as a lid? Oops, sorry..I did mean the knob On the lid, not the whole lid. Sunday morning slip of tongue. I will email Lodge with this question..thanks a bunch!! I keep meaning to tell you I finally got around to doing this. Don't really have an appropriate pot yet so I used this 2 quart corning soufle dish I've had laying about for 25 years or so. Its got a domed lid and handled the bread perfectly. I am not a precise baker but do bake a significant amount of bread. This is the only way I've been successful with this level of fermentation because I am so haphazard. Great stuff! Isn't it great stuff? I love that it's so forgiving. And yes, a two-quart dish works fine if the lid is domed. That's what I've been using lately. Here's a lesson in forgicing: I made a batch of the dough and dropped it off with the kinfolk to bake later. It seemed kind of soupy, but I didn't think anything of it. Later, I discovered I'd used a 3/4 cup measure for the flour, instead of 1 cup, so the dough was 3/4 cup short. And yet ... it still turned out fine! Got here from alectos. Thanks for this. 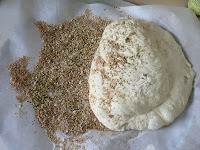 I've had lots of experience with bread, and with fermented bread, (always whole grain because I just don't see a reason to eat it otherwise) but never a no knead method. and never a fermented variety in such a small quantity. So I'm psyched. To David, I would offer that all bread should actually be temperature measured to determine whether or not it is done. The center of the loaf should come to (according to the books) 190 to 200. Personally I've always found 180 to be good. I would not reduce the lid on time as that allows it to rise before the crust sets . . . and perhaps contributes to a lighter (and thus drier) center. Hi CG! Thanks for the tips! I've never checked the bread's temperature. One thing I have started doing is poking three or four holes in the crust with a thin skewer when I take the lid off. That seems to help reduce the gumminess. Let me know how your no-knead works out. 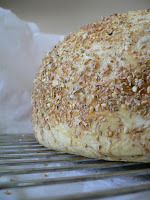 here's my account of my first time making a whole wheat version of this no knead bread! Turned out great! What fun! In a wood stove, even! Looks fabulous. This recipe is so incredibly forgiving and versatile, there's no excuse not to try it. 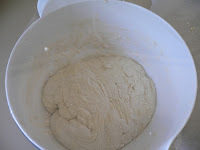 The original recipes says the dough wil double in size after the second (two-hour) rise. I made this twice, and that didn't happen either time. I can't tell from your photo if yours did. Did yours double in size the second time? And if so, what am I doing wrong? Thanks. Hi there. I wouldn't say it doubles, but it does significantly increase in volume. I no longer take it out of the bowl for that second rise. I just fold it over on itself in the bowl three or four folds and cover it up again. Really, though, if your end result is good-looking bread, I wouldn't worry about the second rise too much! 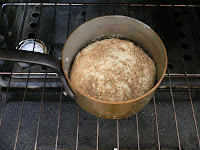 I just tried my first loaf of no-knead bread from "Artisan Bread in Five Minutes a Day," baking it in a dutch oven rather than on a pizza stone as the recipe calls for. Came out great! If you want to try this alternative method, which is a more time-friendly, my post is here. Thanks for the tip, Marina! That's a very good alternative. I love making no-knead bread and am on my 7th loaf.-my favorite tips are to use 2~ plastic thin cutting boards[dollar store] to let bread rise on[covered of course with flour and tea towel]plastic cutting boards are easy to work with without getting your hands tooo sticky-I also use a small blue speckled oval enamel chicken roaster & cover to bake the bread in -this heats up great, light weight and alot cheaper to find. LOVE this bread! !